My new article proposing a sytematic framework for measuring party strength is now out in the German Politics journal. You can read it here or write me for a free copy. An appropriate quantitative measurement of party strength is an essential precondition to any further qualitative assessment of partisan influence. The existing literature offers a number of individual indicators but fails to integrate them into a coherent systematic framework. This article fills that gap by proposing a new multi-dimensional and multi-level framework model to operationalise and measure party strength. The soundness of the approach is tested on the case of the evolution of German parties between 1991 and 2013. 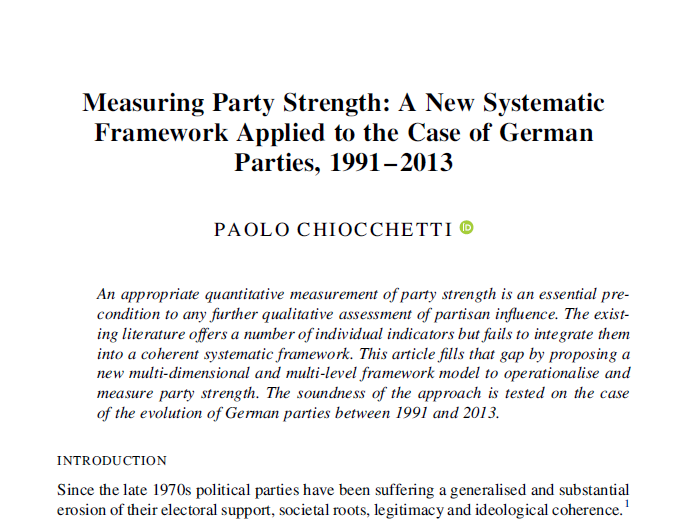 Chiocchetti, Paolo (2016) “Measuring party strength: a new systematic framework applied to the case of Germany, 1991-2013″, Measuring Party Strength: A New Systematic Framework Applied to the Case of German Parties, 1991–2013”, German Politics 25(1): 84-104. DOI:10.1080/09644008.2015.1124090.